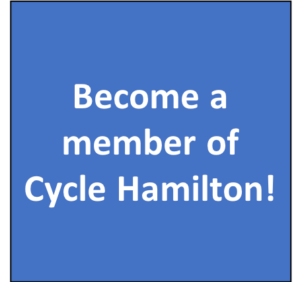 Join Cycle Hamilton on March 26th for our 2018 Annual General Meeting! Doors will open at 6:30 for a half hour of informal networking and socializing. The official AGM events will kick off promptly at 7:00. 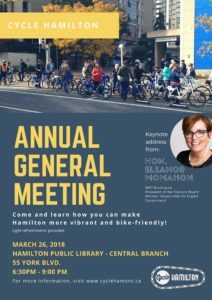 Speakers will include current Cycle Hamilton co-chairs, as well as a keynote address from The Honourable Eleanor McMahon (MPP Burlington, President of the Treasury Board, Minister Responsible for Digital Government). Eleanor McMahon was elected to the Ontario legislature in 2014 as MPP for Burlington, and is currently President of the Treasury Board and Minister Responsible for Digital Government. Previously, she served as the Minister for Tourism, Culture and Sport and as Parliamentary Assistant to the Minister of Natural Resources and Forestry. Eleanor is known for her advocacy for safer roads for cyclists and founding the Share the Road Cycling Coalition in response to the tragic accident that claimed the life of her husband OPP Sergeant Greg Stobbart in 2006 while riding his bicycle. Eleanor has spent her career in senior roles in business, government and the not-for-profit sector.